Let me put it out straight. 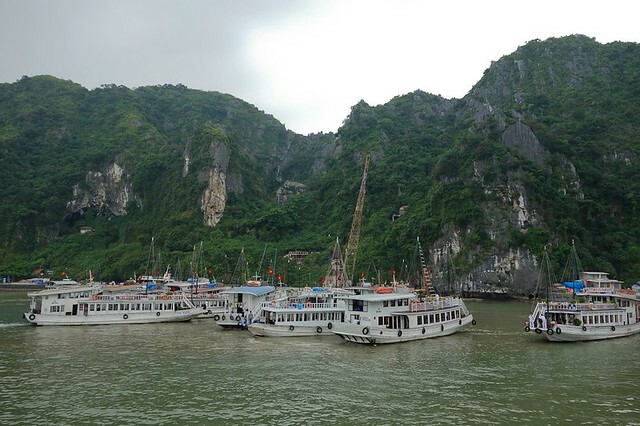 Do not believe everything you see or read about Ha Long Bay cruises. 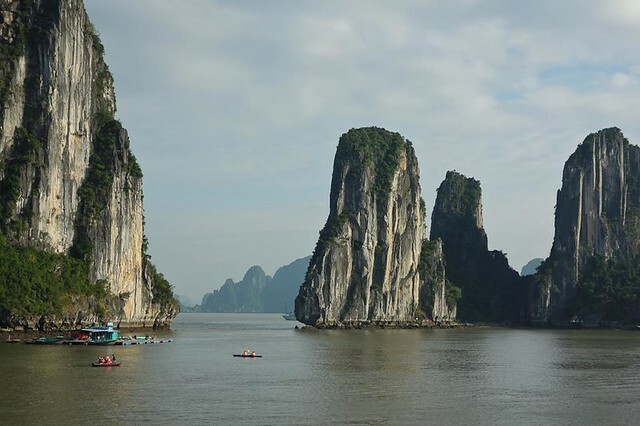 I say cruises because Ha Long Bay itself is beautiful and spectacular at times. Others might say that limestone formations here go pale when compared to El Nido and the waters of Ha Long cannot, in any way, compete with the turquoise waters of El Nido. But still, Ha Long Bay is a UNESCO World Heritage Site worth seeing... if only you know what to expect. The 'oriental junk' you see in the photos is nowhere to be found..gasp! I did not see a single junk that looked like this. I overheard a guy complaining that the actual boat did not look like the same boat in the photos the agency showed him. Well, sir, you've just been punk'd. 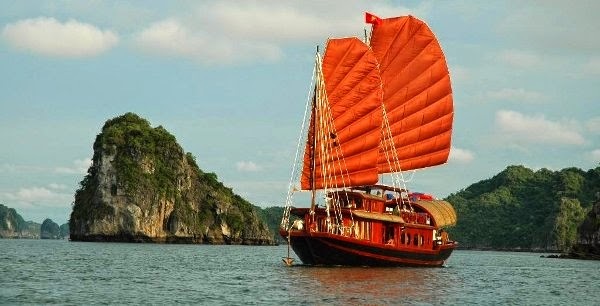 Every agency will show you a photo of a nice oriental junk with all its sails up and once you get to the port, you will see dozens of white regular-looking boat. If you paid over a hundred dollars, you might as well complain. The photos we were shown were like the photo above, but when we got to the port, we were ushered to a white boat, definitely without sails. The prices would range from 30USD to over 100USD for an overnight trip. And you wonder why since you're all cruising in the same bay, you're all seeing the same things, and you're all staying in identical-looking boats. It has to be with the food they serve on-board. Dinner time came and since the whole thing is planned by the minute, our boat was in the middle of the bay next to another boat. The other boat had better and bigger meals so I could only guess that they paid higher. Based on my experience, it is better to book once you are in Hanoi so you can haggle, ask questions, and haggle some more. 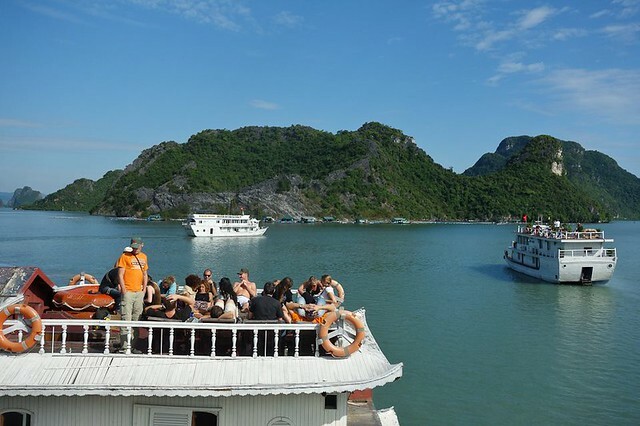 Remember that you are all going to have the same Ha Long Bay experience so it's better to know what the extra dollars are for. If you get an expensive cruise, you will be definitely be served with great food, probably a luxurious bed, sheets with higher thread count, and a nice bath but basically, the whole experience - cruising, kayaking, caving - is the same. And there's another point of booking a boat with fun cruise mates, especially if you're a solo traveler. Book an expensive cruise and you will join families and their kids who would retreat to their rooms early in the night. Book a cheap cruise and aside from the crappy food, you'll get a crowded boat. It all depends on what you want. If you would like to mingle with fellow cruise mates but still have a room for yourself, book a mid-priced boat. If you prefer to have your quiet time, go for the higher priced ones. We booked a 50USD cruise and luck was on our side. We boarded a boat with a great mix of fun people. A girl solo-traveler crossed over from another boat to ours because she paid a hundred and the night ended early on their boat. The boats were anchored so near to each other that the girl just crossed a short plank from their boat to ours. 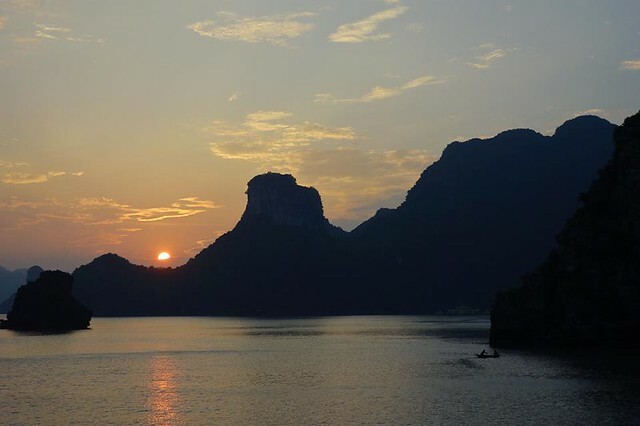 I have not been to El Nido so I could not compare, but even so, I saw Ha Long as a low-contrast photo that if given the chance, I would have turned up the contrast a sharp higher and tweak the image sharpness too. The waters were gray and not inviting at all when we were there. I read some people would dive and swim and I wondered.. why would you even want to swim in dark, murky waters? Watching the sun slowly setting behind the karst, however, was a different story. It's one of the Ha Long Bay memories that I chose to keep. The next day, I curled up with a book and soaked under the sun with the limestones hovering over the boat. A beautifully manipulated photo combined with nice words can easily fool anyone. Traveling is never without glitches and Murphy's Law is always in effect. 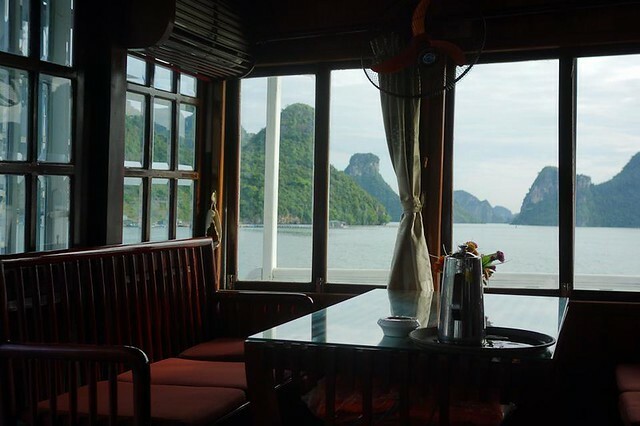 The trick to this, appreciating Ha Long Bay and any other place for that matter, lies in researching to get an idea of what to expect, preparing for it, and aiming to have a great time regardless if things don't go your way. Pretty soon, you will find something amazing. I will most likely not go back to Ha Long Bay anytime soon, but even when I was a tad disappointed, I would still say that one needs to visit this place at least once in this lifetime. This is my entry to the Pinoy Travel Bloggers' April 2014 Blog Carnival entitled When Fact is Really Fiction hosted by Kaiz Galang of Miss Backpacker. Our Islamabad Vip escorts square measure consummate flawless, VIP Islamabad Escorts astonishing and have frame sense to show up a huge amount of sizzling.people who square measure endeavoring to mess around with Drama player and high slope models in Islamabad haven't any should pressure in view of we will give you VIPs on premium start. we have a gigantic ability in giving escorts in Islamabad, Escorts administrations Islamabad from different escorts workplaces.